I’ve learned that prolonged research into Anthropometric Data and applying these principles to space planning/technical drawings can cause blurred vision, feelings of despair/anguish, and a ridiculous amount of comfort eating. So, I decided to take a break from such pain and misery by turning my attention to lace. Beautiful, simple and elegant lace. I’m using lace within this particular design scheme because this (period) building is located within the Lace Market of Nottingham. 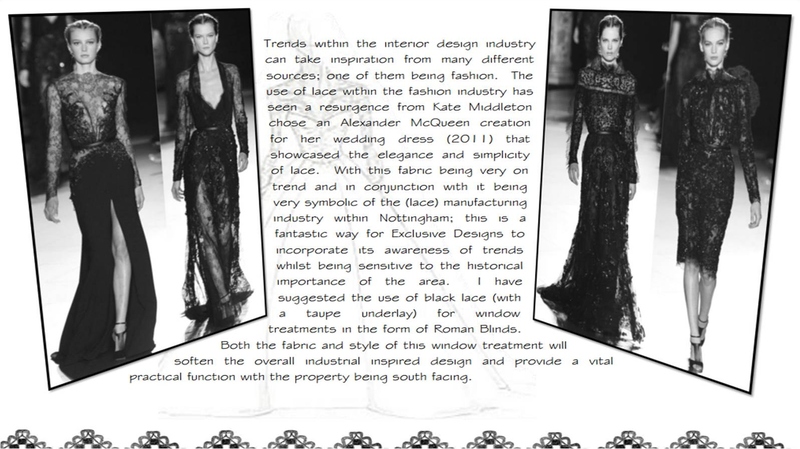 Not only will the incorporation of lace acknowledge the history of the manufacturing industry within this area but it’s also very on trend. Bonus points! In total there will be 2 design features within this space that will give a gentle nod to the heritage of the Lace Market; the lace Roman Blinds and the interior of the lift. Yes, you heard correctly; the interior of the lift. And what’s more unexpected than casually walking into a lift and witnessing a visual treat? In my humble opinion, lifts are undervalued for their contribution to the element of surprise. In my previous blog post about lace effect wallpaper I made reference to the Occa Home Ribbon Damask wallcovering and I’ve decided that this exquisite lace effect wallpaper combined with wall panelling in the lift would be a great design feature. It’s symbolic of the historical relevance of the lace manufacturing industry in Nottingham and the wall panelling provides a cheeky reminder of the Georgian architecture of the building. It also acts as a sharp contrast to the overall industrial inspired design of the reception area. I loved this idea so much that I put together a quick 3D visual and it looks just as fabulous in (virtual) reality! Bet you never thought a lift could look so damn good, eh?! 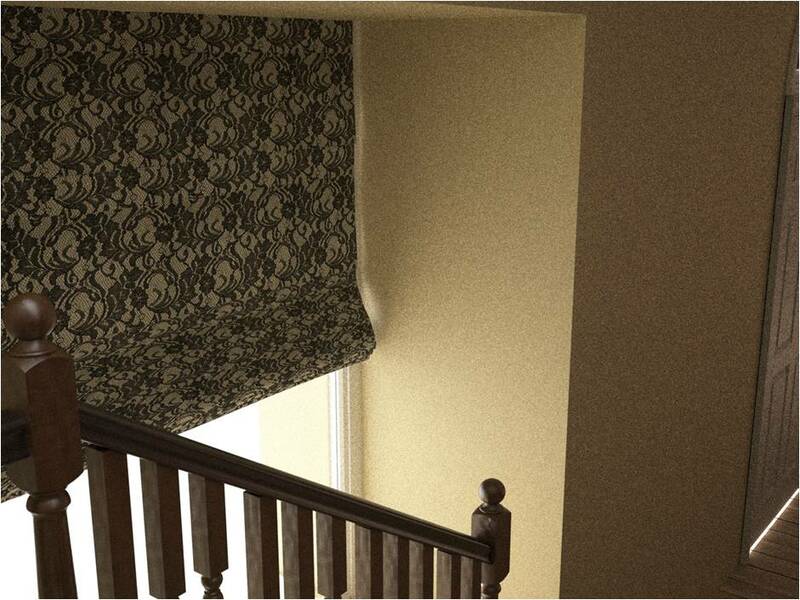 I’ve also added a 3D visual of how the Roman Blinds could look. I personally think they add so much more sophistication and elegance to the design scheme, and will help to soften the hard edges of the industrial inspired design elsewhere in the space. I love the idea of using lace for the wall covering and blinds and I can’t help thinking that this would look great in the Staff Breakout area as it will fit perfectly with the furniture you have chosen. I like that you have split the wall with wood paneling also to bring in the period touch, it looks like a small room and I would be tempted to add a chair or two. I like the idea of a lift where there is something else to look at than the door or the back of the person in front of you. People will not only look but be tempted to touch and certainly will comment on it, mission accomplished! Your rendering of the blind is really good and gives a very realistic idea of the design and texture and it fits perfectly, I really like the idea.